I’ve never really been a fan of the knit dress, but now I understand why they are so popular. They’re easy to style, pack well, and can be dressed up or down. What’s fun about this dress is the color-block detail and contrasting blue and white vertical stripes. It’s a great dress for now and later! Get ready quick. It takes the guesswork out of getting ready. Depending on the weather, you can either go bare leg or wear tights. Then top things off with your outerwear or a lightweight sweater. You can also get creative and style this dress with a cute pair of sneakers, wedges, or flats. Wear on multiple occasions. What’s great about this dress is that it works for the office by adding a lightweight blazer, you can wear it on vacation, or even when running errands. The lightweight material and length make this dress super flattering and comfortable. Perfect for wherever the day takes you! Great for vacations. This dress is perfect for travel since it won’t take up much space in your luggage. It will also pack well and need very little ironing, especially if you roll the dress instead of folding. It makes you think outside of the box. It’s like the modern take on the little black dress but a bit more interesting. You can wear it as a skirt (shown here), with a vest (today’s post) or with a lightweight jacket. It would also look cute with a tied waist blouse or a white denim jacket. You can change up the overall look and feel with accessories. Wouldn’t this dress look so cute with a floral or striped scarf? I like the idea of mixing prints, especially in the warmer months. If you are in the market for a knit dress, look no further than J.Jill for some cute spring essentials. They have a plethora of great options. Are you a fan of the knit dress? Share in the comments. 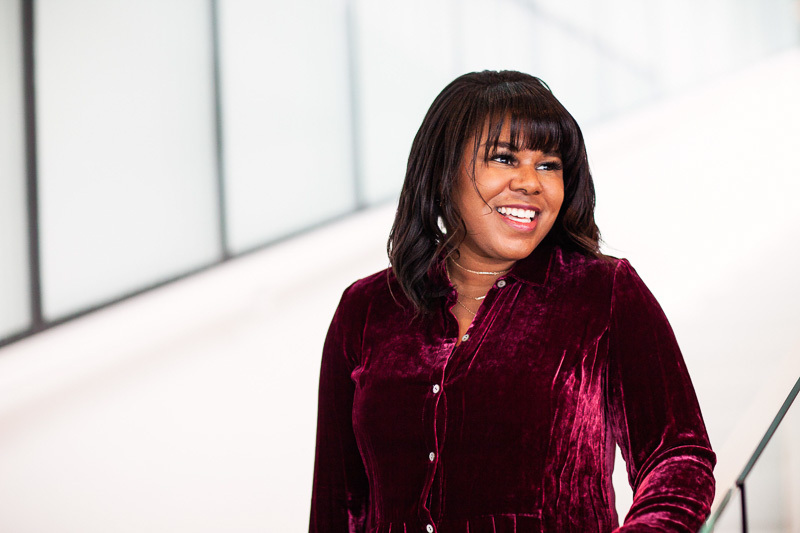 Since gaining over twenty pounds, the majority of my clothes no longer fit, but instead of holding onto everything, I went ahead and put most of my closet on consignment and gave the rest away. I understand that getting rid of things can be scary, but I’ve always been very focused on keeping my closet in order, so I knew it was the right decision for me. Plus, if I lose the weight, I know that I’ll want something new and that makes me less worried about feeling remorseful. Top 10 Post of 2017! I polled my Instagram audience and asked whether you wanted to see a reflection post or a top 10 post. It was a tie, so I decided to do both! 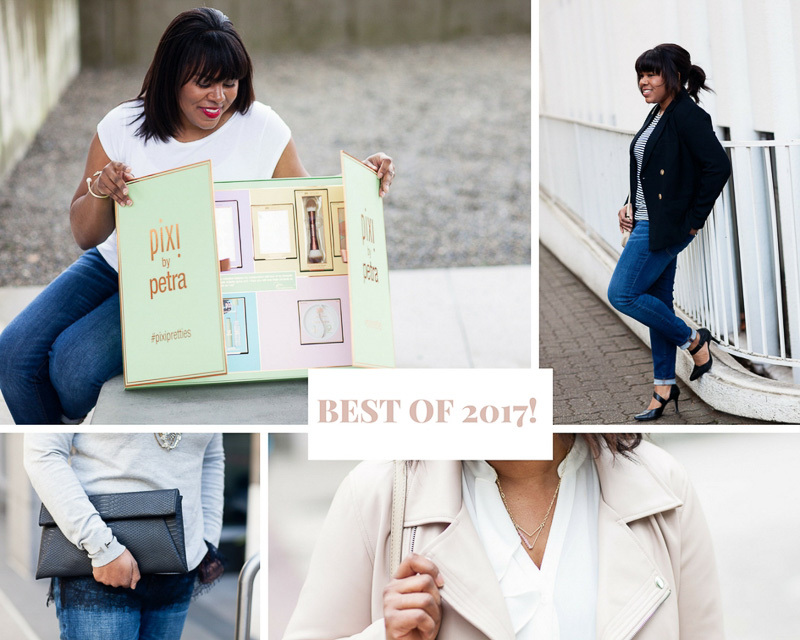 My reflection post is here and keep reading for my top 10 posts of 2017! Top 10 Posts of 2017! Any post with a giveaway ranks high. With that said, Pixi beauty is a well-respected drugstore brand that is affordable and effective. In this post, I share about the products I’m liking in addition to several other Pixi reviews and shopping links. I wrote this post in my first year of blogging and later updated it. What a timely post! It will definitely help you refocus in the new year and get things in order. 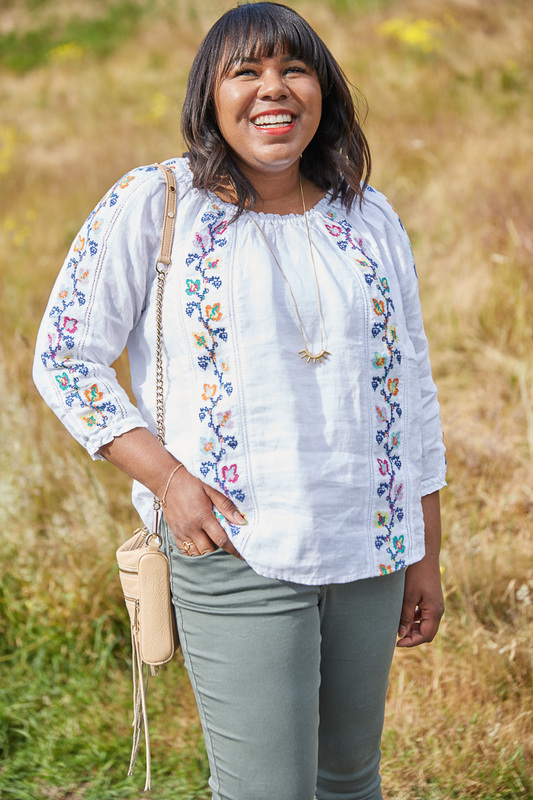 I teamed up with Stitch Fix in their My Body My Style campaign. For this collaboration they featured me on their blog and gifted me a shopping credit. 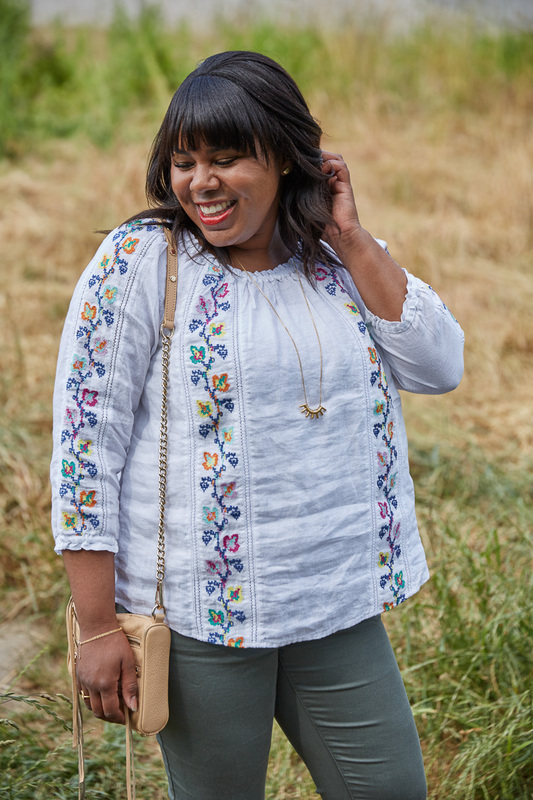 If you’re in a style rut or need some inspiration, I highly recommend you read this post and sign up for Stitch Fix! One of the perks of blogging is that you get to partner up with small business owners. Monifa had just launched her line and approached me to collaborate. Her pieces are gorgeous and I was ecstatic to partner with a fellow female entrepreneur! This post is also a great one for the new year! Surprisingly, I had forgotten some tips and am finding them useful. This is definitely a must-read. Do you have clothes in your closet with the price tag still on them? What about buyer’s remorse? If so, this post is for you! The key takeaway: invest in what you want from the beginning instead of cutting corners because it will ultimately save you money. 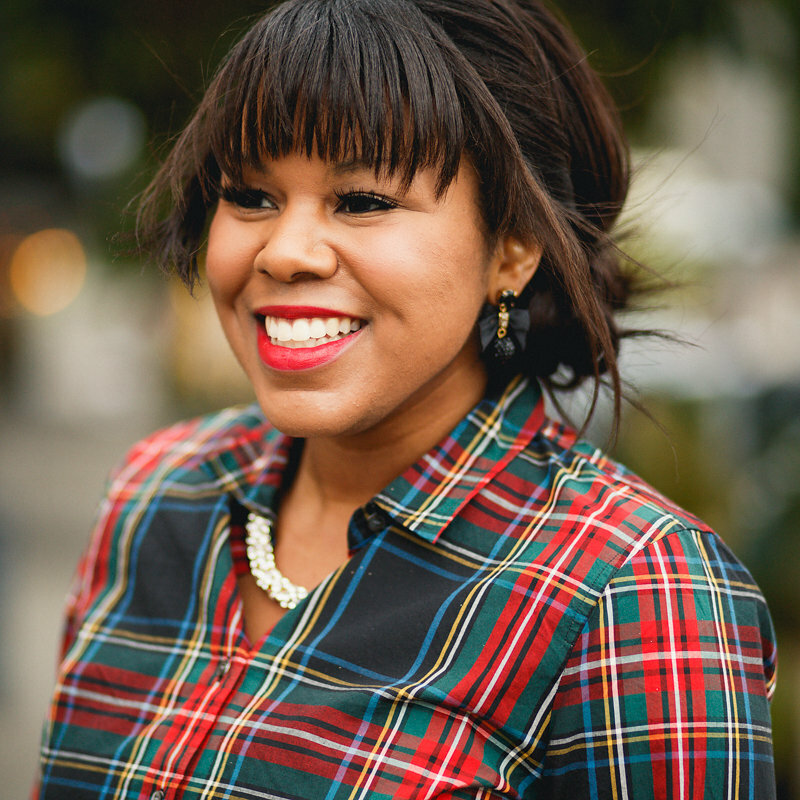 In this post, I show you how to maximize your wardrobe without feeling overwhelmed. It’s full of actionable tips that you can begin to incorporate today. Toward the end of the year, I began partnering with J.Jill. This is my first post with them featuring three daytime looks that easily transition to night. One of my biggest struggles when it comes to fashion is finding comfortable shoes! Even though this post was written in the summer, it’s a great resource for anyone who is looking to learn more about stylish comfort brands. It has been a long-term goal for me to launch my own jewelry line. As you might have gathered, I am a big fan of jewelry and all things girly! Check out this post to see where the journey began. Thanks for a great year! 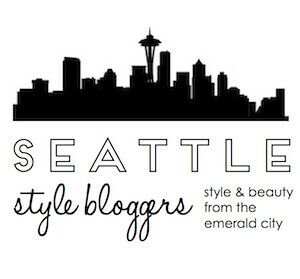 Which post is your favorite and what would you like to see more of on the blog? Let me know in the comments. Your feedback is so important. Velvet is one of those fabrics that people either love or hate. I hear things like “That looks like something my grandma would wear,” and “Do you remember when I had a similar top? You were a lot younger so you probably don’t remember.” I don’t know about you, but I’m a bit old school and love a more classic look, so I don’t really have a negative view when it comes to velvet. I do, however, think of the Victorian era or my mom’s burgundy velvet chaise lounge from back in the day. Nowadays, velvet has really become modernized. I see it in every available option, from skirts and dresses to handbags and boots! Plus, there are a lot of affordable options and if you’re not comfortable fully embracing this luxurious fabric you can easily do an accessory and call it a day. 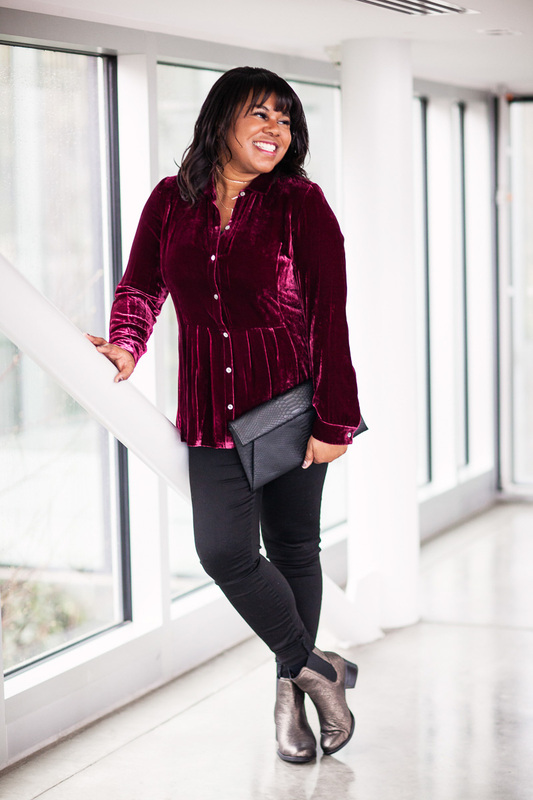 What I like about today’s look is that it’s a pretty simple outfit: black denim, Chelsea boots, and a crushed velvet top. I’m obsessed with the burgundy color and love the pleats. 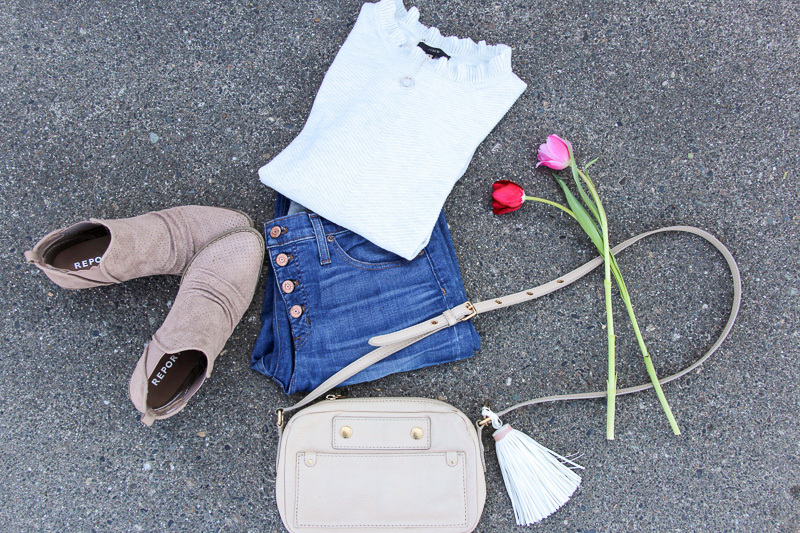 So girly and feminine! Choose something you would actually wear. If you are scared to go all out, try something subtle like a velvet ribbon in your hair, a cute choker, or a clutch. I also love the element of surprise like a sock bootie. Pick a color that mixes well with others. I’m a big fan of color, but if you aren’t, go for something more subtle. Black is a no-brainer and easy to style. Darker tones like navy and green work great too. Don’t overdo it. A little goes a long way! Choose one item to wear: top, dress, skirt, pant, or blazer. 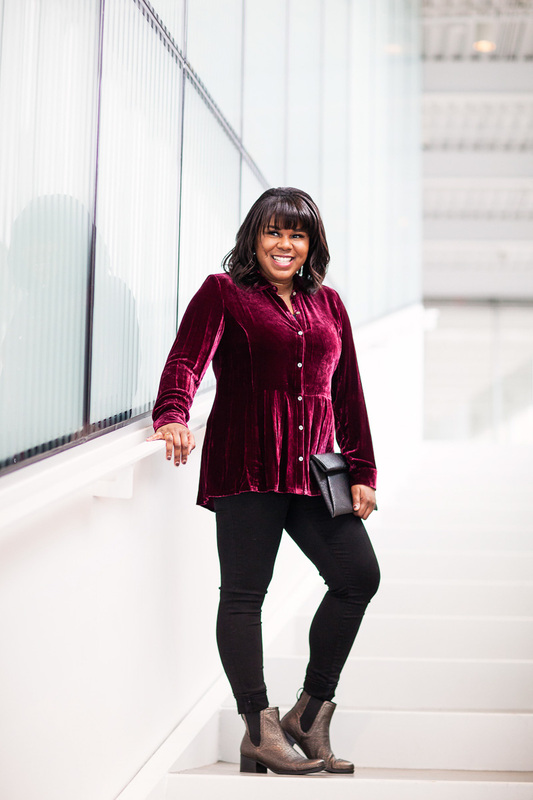 I would also avoid head-to-toe velvet, unless you like to go all out of course! Wear it with a classic. Still struggling with how to style? 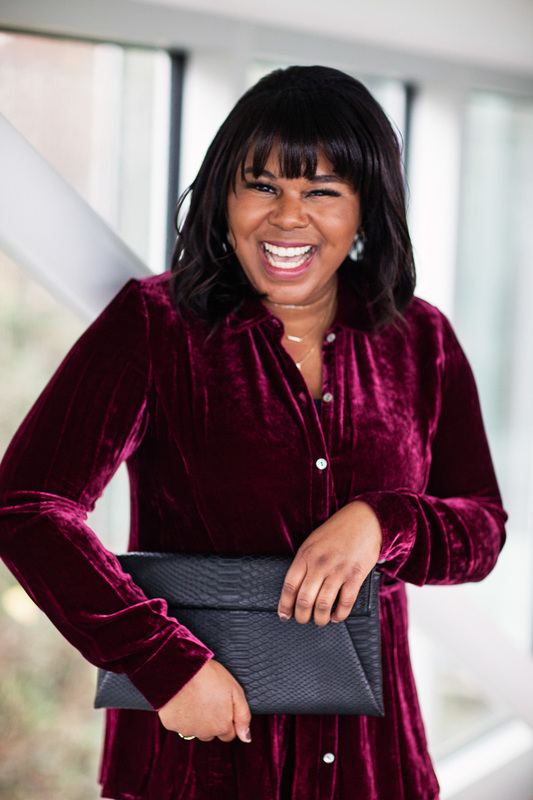 Wear your velvet with one of your favorite closet staples. Take the chambray shirt for example. It would look great paired with a velvet skirt! Or you can always wear a velvet jacket over a simple white tee. What velvet pieces are you planning to incorporate into your wardrobe this winter? Share in the comments.